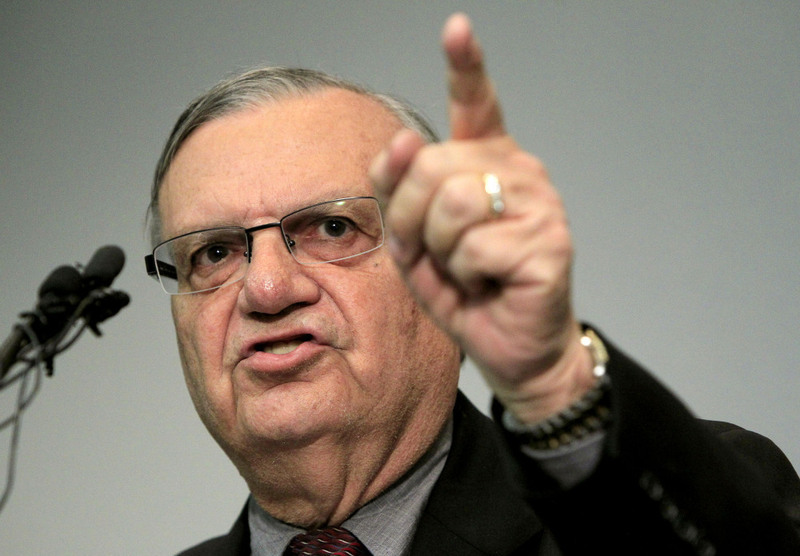 Sheriff Arpaio Sends Publicly Funded Deputy To Hawaii On 'Birther' Hunt : The Two-Way Joe Arpaio sent his deputy on a quest to investigate the citizenship of President Obama. Arpaio had previously said his investigation was funded using donations. Maricopa County Sheriff Joe Arpaio in 2011. It seems there's not a month that goes by that Maricopa (Ariz.) County Sheriff Joe Arpaio isn't involved in one controversy or another. As we've reported, Arpaio is already facing a federal civil rights lawsuit. But now there's news that Arpaio is using public money on his quest to investigate President Obama's birth certificate. Both the Arizona Republic and Honolulu Star Advertiser report that Arpaio sent his deputy, Brian Mackiewcz, to Hawaii in part because of what Arpaio said were "security issues," related to the investigation. "The detective assigned to the Obama investigation works in the sheriff's threats unit, and continues to work on other cases while assisting with the posse's investigation, according to the Sheriff's Office. The Advertiser reported that two men — one of them Mackiewcz — went to the Hawaii Department of Health requesting verification of Obama's birth certificate. The department already issued that certificate at the president's request. They also released a statement in which the Hawaii health director said she had certified the copy. In a news conference back in March, Arpaio said he had undertaken the investigation of Obama's residency using donations. At that same press conference, Arpaio presented evidence that the birth certificate was "computer generated forgery." As we noted at the time, some of the evidence was very flimsy.